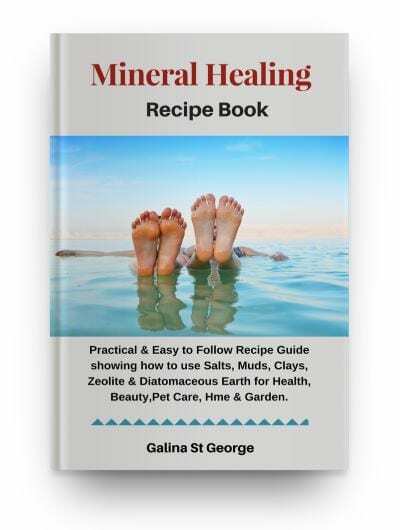 If you enjoy learning about the healing power of minerals in practice, you should check out the guide which I launched in summer – “Mineral Healing Recipe Book”. The guide is the second part of the “Mineral Healing” free report which you may or may not have read yet. “Mineral Healing Recipe Book” comes with mindmaps which will guide you through various aspects of using minerals for health. There are 3 options – you can buy the book with the mindmaps, without them, or you can opt to buy only the mindmaps. 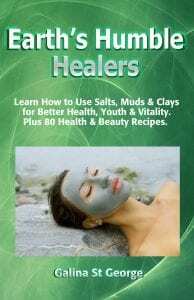 The guide was written both for natural health practitioners and members of the public who would like to learn more about how to use salts, clays, muds and other minerals at home and what they can help with. So if you love spa treatments but have no time (or money) to get them done regularly, why not create your own spa at home? With my guide, you won’t be short of recipes or ideas. The product is available for purchase through our own site, via Clickbank, or via JVZoo.com – whichever option you prefer. 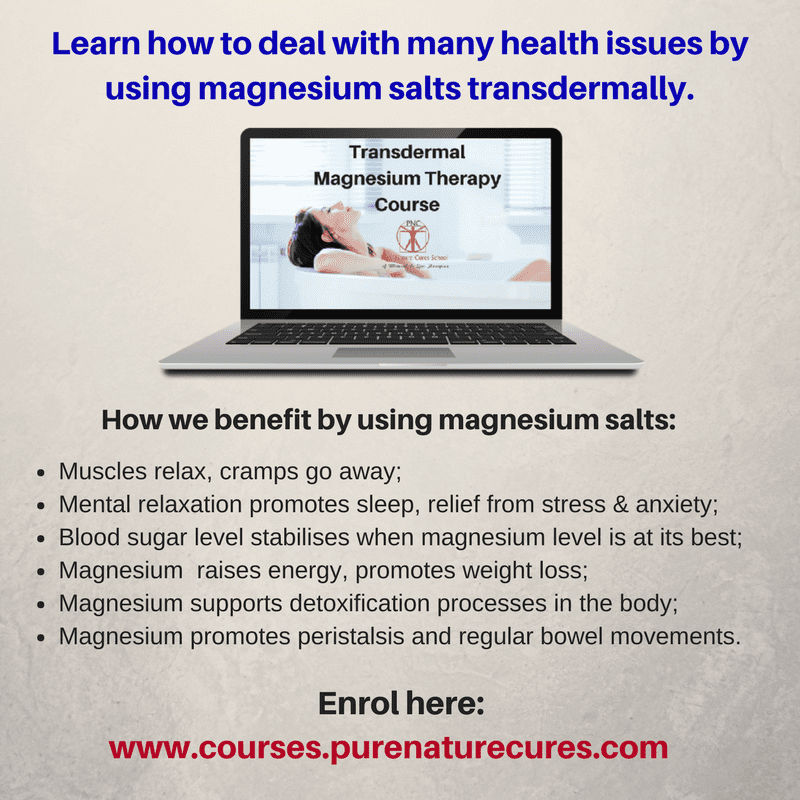 You may also be interested in checking out the Transdermal Magnesium Therapy Course. 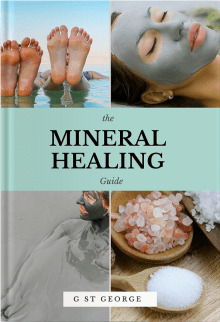 If you buy “Mineral Healing Recipes Book” through Clickbank or JVZoo you’ll be offered to buy the course as an upgrade. Alternatively, if you are only interested in the course you can check it out and make the purchase here. What is the course about? It covers therapeutic benefits, uses and applications of magnesium salts. One cannot over-estimate the importance of magnesium for our health, both physical and psychological. With magnesium being the 4th most abundant mineral in the body and one of the most deficient, is it any wonder that heart disease, diabetes, obesity, mobility issues are on the rise? Transdermal Magnesium Therapy is a very effective way of addressing magnesium deficiency and underlying health issues. It is a unique course developed by ourselves to be taught by our online School of Mineral & Spa Therapies. Both therapists and members of the public can study and benefit from studying the course. I started streaming them on one of my facebook pages last year, but after a while decided to postpone further live streams till later in the year after the launch of the two products I have mentioned above. I will start streaming them next week. Check this Facebook page if you want to watch them there. I will also be posting every workshop on this blog. Workshop 1 – Introduction. Brief history of mineral use. How minerals are being used by humans & animals. Workshop 3 – Healing Salts. 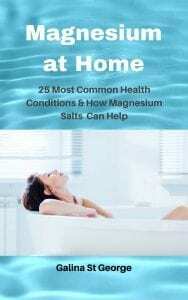 Magnesium salts. Workshop 8 – Treatments which you can do by using minerals. Workshop 8 – Transdermal Magnesium Therapy – therapy & the course. Workshop 1 – What is Far Infrared and how it benefits our health. Workshop 2 – Treatments which can be done by using far infrared and minerals. How they interact together. Workshop 3 – Far Infrared Magnesium Wrap – treatment and course. Workshop 4 – Far Infrared Mineral Weight Loss Wrap – treatment & course. Workshop 5 – Far Infrared Clay Detox Wrap – treatment & course. Workshop 6 – Far Infrared Remineralising & rejuvenating wrap – treatment & course. Workshop 7 – Which course should you take? What are the options? Workshop 8 – Other courses I am working on. Your questions answered. Series 3 – Which Mineral & Which Treatment for My Problem? 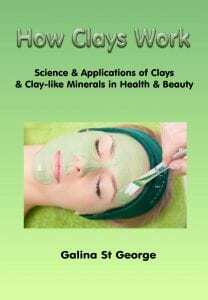 Workshop 1 – Introduction to using minerals in health & beauty. Workshop 2 – Stress, anxiety, insomnia, fatigue, headache, migraine. Workshop 3 – Pain, aches, cramps, tension – muscle & joint problems. Workshop 4 – Weight issues, high sugar & cholesterol. Workshop 5 – Beauty issues – skin, nails, hair & scalp problems. Reversing signs of ageing. Workshop 6 – Toxicity – how to cleanse the body of unwanted deposits, heavy metals, fungi, parasites, intestinal stones and more. Workshop 7 – Strengthening immunity. Workshop 8 – Other health & beauty issues. Answering questions. This list may change as I go along, depending on the feedback and questions. 4. Pure Nature Cures Facebook group. 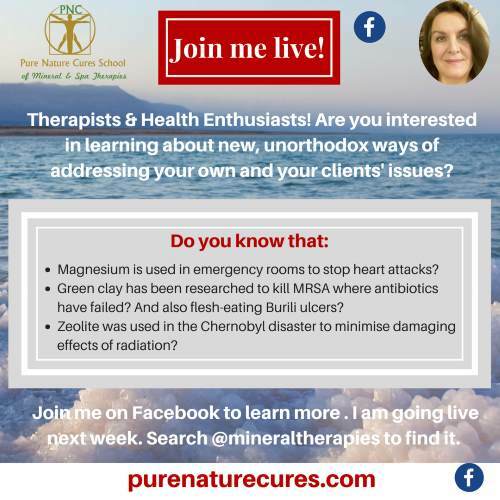 We started a Facebook group a few months ago and I would love to invite you to join it if you are interested in mineral healing and all things related to natural remedies. It would allow you to keep in touch with us daily, ask questions and post updates about your mineral healing journey. 5. 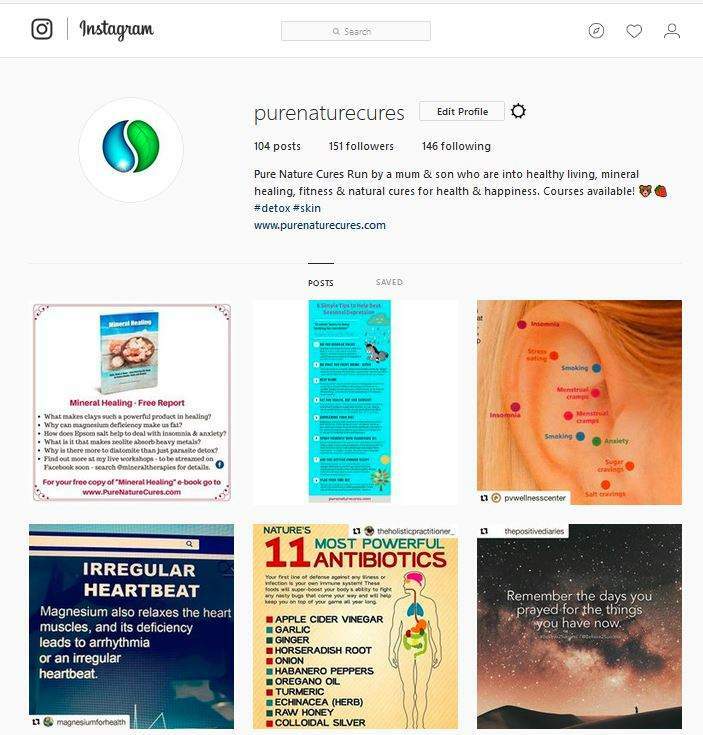 Follow Pure Nature Cures on Instagram. We have also started being active on Instagram, so if you are one of those people who love the platform, we’d love to connect with you!